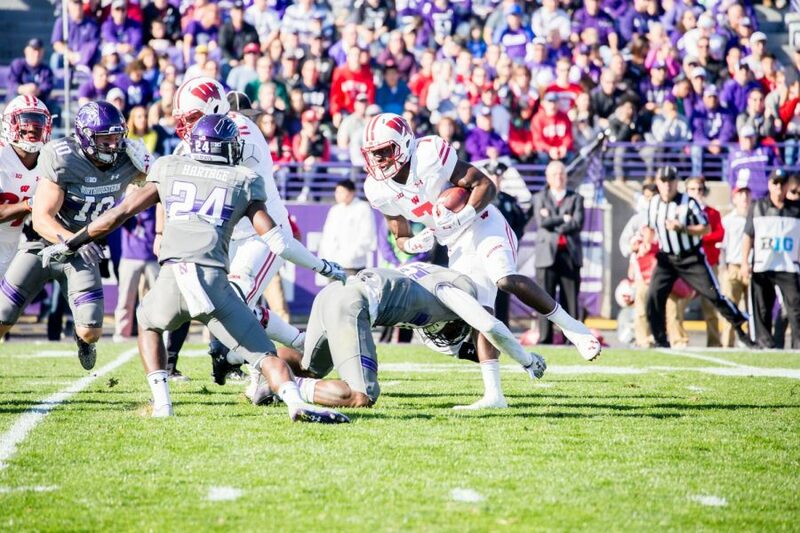 Wisconsin running back Bradrick Shaw evades Northwestern defenders in a 2016 game. This year’s meeting between the two teams is likely to be critical in deciding the Big Ten West standings. The new nine-game Big Ten conference schedule, first implemented last year, will work in Northwestern’s favor this season, giving it five conference games at Ryan Field. Two of the Wildcats’ four away games, moreover, will be relatively short trips away — at Illinois and at Wisconsin. Added to a relatively easy non-conference schedule (with two of the three games also at home), NU’s 2017 slate should set the team up well for a solid season. The Wolf Pack and Cats will meet for the first time since a two-game set in 2006 and 2007 in this autumn’s season opener in Evanston. Nevada started last season 3-7 before winning its final two meaningless games, and new coach Jay Norvell is attempting to install a new Air Raid system to an offense that is returning only five of 11 starters. The Cats’ experienced defense should view this as a favorable matchup against a rebuilding program in a lesser conference. NU’s four-year series with academic peer Duke continues in Durham this September, where the Cats won 19-10 two years ago in a game that featured, at one point, 11 consecutive possessions ending in punts. The Blue Devils are seeking to bounce back from a disastrous 1-7 season in the ACC and will have a more tested Daniel Jones back at quarterback but not a lot of talent around him. NU seems to have picked the right time to begin playing Duke every year — simultaneous with the Blue Devils’ sharp decline from the high-water marks of coach David Cutcliffe’s tenure, when Duke ended a 17-year bowl drought with four straight postseason trips. Bowling Green lost eight of its first nine games last season — including a 77-10 rout at the hands of Ohio State and an even-worse 77-3 loss to Memphis — before finishing the campaign on a three-game winning streak, largely because the defense that had allowed an unsightly 45.1 points per game through the first nine contests finally woke up and allowed only 54 points over the next three games combined. With just six of 11 starters returning on each side of the ball, the Falcons’ odds of returning to the relative glory of 2015 — when they went 10-4 and won the MAC — appear low. The Cats should be large favorites for the Wildcat Welcome night game. Wisconsin extracted revenge for NU’s controversial 2015 win by topping the Cats 21-7 in Evanston on national television last fall, but fans in Madison will likely still be fired up for the team’s Sept. 30 conference opener. Both teams are strong bets to enter the game undefeated — the Badgers non-conference opponents are Utah State, Florida Atlantic and BYU. The Badgers seem to excel year-after-year at their signature grinding style no matter the personnel, but they will have to replace star running back Corey Clement this season. They’ll nonetheless still enter the season as a popular Big Ten West champion pick, so a road victory for NU could prove season-defining. Penn State is poised to contend for a national title in 2017 — explosive 2016 stars Trace McSorley, quarterback, and Saquon Barkley, running back, are both back, prompting Sports Illustrated to rank the Nittany Lions fifth in their preseason Top 25. First, though, Penn State will have to get past the Cats during homecoming weekend in Evanston. NU pulled out a thrilling 23-21 win on a last-minute field goal two years ago and hasn’t lost to the Nittany Lions since 2012. The Cats will get their first crack at Maryland — despite the Terrapins joining the Big Ten in 2014, they have never before faced NU in program history — in a mid-October game that was originally scheduled for Friday, Oct. 13, then pushed back a day. The Terrapins are coming off a bowl berth in 2016, but the five FBS teams they beat to get there recorded a combined record of 18-43. The schedule will inevitably be tougher in 2017, and with three starters gone from one of the strongest parts of the 2016 squad (the defensive line) and a lot of uncertainty at the quarterback position, Maryland will likely circle this home game against NU as a must-win in order to return to the postseason. The Cats had lost 48-7 and 40-10 in their last two meetings with Iowa before pulling off a shocking and season-reviving win in Iowa City last fall. This year, the Hawkeyes will come into Ryan Field wielding an overhauled offense with a new offensive coordinator, a new quarterbacks coach and a new (and yet-to-be-named) quarterback. Iowa’s defense looks nearly flawless, however, and Clayton Thorson and Justin Jackson will need to be on top of their games in this crucial intra-division battle. Michigan State was one of the nation’s biggest surprises a year ago, and not in a good way: the Spartans’ fall from 7-1 in the Big Ten and a playoff appearance in 2015 to 1-8 in the Big Ten in 2016 seemingly came out of nowhere. The Cats edged the Spartans in an uncharacteristic 54-40 thriller last October in East Lansing, but both coach Pat Fitzgerald and Michigan State coach Mark Dantonio will likely hope for a more reasonable defensive showing this season. The Spartans can’t possibly stay in the Big Ten cellar for long, but NU should consider itself lucky to draw Michigan State in inter-division play yet again. In the six meetings between the Cats and Cornhuskers since Nebraska joined the conference in 2011, the road team has, thus far, won five. NU will hope to continue that trend at least one more year when it travels to Lincoln in November. For the Cornhuskers, the departures of last year’s leading passer, leading rusher and leading receiver have left a lot of questions to be answered during the team’s very easy first five games (with dates against Arkansas State, Oregon, Northern Illinois, Rutgers and Illinois). New coach Jeff Brohm, hired by Purdue after a successful tenure at Western Kentucky, is inheriting a program that sports a 9-39 record over the past four seasons. Even if Brohm proves the key to turning around the Boilermakers, it’s unlikely he’ll be able to do it in one year. Purdue squandered an early 10-0 lead against NU last year to lose embarrassingly, 45-17, at home; they could be in for another beatdown this season at Ryan Field. The last two games between NU and Minnesota have each gone decisively in favor of the home team, with the Cats shutting out the Golden Gophers 27-0 in Evanston in 2015 before falling 29-12 in a sloppy, frigid contest in Minneapolis last year. The Golden Gophers are quietly poised for an excellent 2017, with a massive offensive line ready to open up holes for powerful running back Rodney Smith and an already-solid defense returning almost all of its major contributors. Assuming that Illinois is several years away from Big Ten West contention, this game could be the deciding moment in NU’s push towards the conference championship game. NU will close out its regular season, as usual, against Illinois, making its first trip south to Champaign since 2013. The Cats have won four of the last five meetings with their in-state rivals and Illinois coach Lovie Smith will need to work some magic to reverse that trend this year, as the Fighting Illini are losing their quarterback, two of their top three receivers and most of their defensive starters from a 2016 team that won only three games. Fitzgerald has always said that statistics go out the window when preparing for a rivalry game, but the numbers do look lopsided in his team’s favor nonetheless.